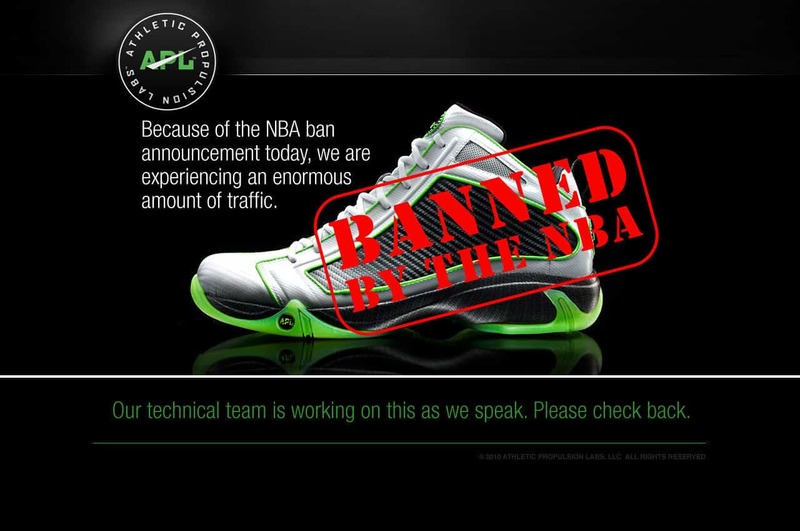 Marketing for APL Basketball Shoes capitalised on being banned by the NBA. Serious athletes often find themselves wondering if their choice of footwear is impacting on their performance. Research has shown that choice of basketball sneakers can indeed have an impact on your vertical as well as various other factors such as speed and agility. The vertical leap is a measurement of how high an athlete can jump off the ground from a standstill using only his/her own muscles. If you add weight to anything it takes more energy to move that mass, so it then makes sense that the heavier the basketball sneaker that the player is wearing, the lower his/her score will be. This is true for the test itself, however wearing heavier or strength building sneakers can indeed build up the various leg muscles such as the calves, quadriceps and hamstrings. These are the muscle groups involved in increasing overall leg strength, over time resulting in better score results. The same results can also be achieved through flexibility training and muscle specific exercises in the gym. Basketball players would be familiar with the high top basketball shoes found commonly around the entire globe, while these shoes have been found to reduce incidents of ankle injuries, they have also been proven to reduce your jumping score. The hi top sneaker does not allow for very much flexibility of the ankle joint, which is crucial in achieving the high vertical jump score we all desire. There is scientific based evidence that a basketball shoe can indeed improve your score, based on the inclination angle of the shoe. Put simply, this refers to the angle of the foot when the basketball shoe is being worn. Researchers found that a 6-10% increase in vertical leap score could be achieved simply by changing the inclination of the foot to a decline (toes above heels) angle. Basketball shoes with such an angle simply do not exist in the mainstream market, and there is no suggestion that they would be safe for running or training in. In conclusion, basketball shoes, lightweight clothing and dropping a bit of personal body weight can have a small impact on your performance and overall vertical jump score, but the very best proven method of improving your leap is found in good old fashioned flexibility and strength training.